Should we choose TVI/AHD/CVI analog HD or IP when we upgrade our CCTV system? - A blog about IP video security solution. A blog about IP video security solution. 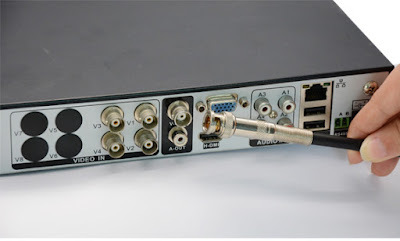 JOE ZHANG PRODUCT MANAGER SYSTEM UPGRADE Should we choose TVI/AHD/CVI analog HD or IP when we upgrade our CCTV system? Should we choose TVI/AHD/CVI analog HD or IP when we upgrade our CCTV system? People predicted the IP camera would replace analog camera very soon in few year ago. It seems the prediction is not so correct. The analog products are still showing the strong shipping today. To be fair, those HD analog are not the traditional technology which has limited resolution to 700tvl. The new analog technology, named TVI/AHD/CVI, can easily deliver 2 megapixel, even 4 megapixel resolution. What should we choose when we decide to upgrade our CCTV system? Let’s take a close look at the differences between those technologies. 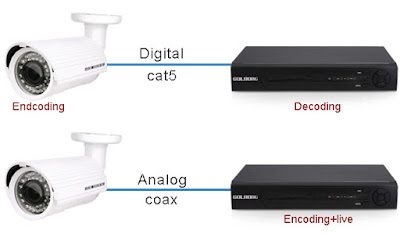 The new analog camera TVI/AHD/CVI can deliver high definition video in the coax cable up to 300 meters. That means you can use your existed coax cable to carry the HD video when you upgrade the system. Simply replacing old cameras and DVR (recorder) can make the job done. It is important to understand the DVR need to be replaced. This is quick and fast way to transfer your analog to HD video system. How about the video quality? If we put one analog HD camera and one IP camera on the same monitor, we will find the picture quality is not the same, even both cameras have same image sensors and resolution. The IP camera receives the raw video from the image sensor and encode to H.264/H.265 immediately. However the analog needs to travel among with coax cable before it reach the recorder. This process creates a lots of signal loss. We can find the significant differences especially when we look at the footage. HD analog did have one advantage – live view without delay. The analog camera doesn't need to involve any encoding process, but the IP camera need to decode in the camera and encode at the NVR, you will experience 150-200 millisecond delay with IP camera before you see the video on the monitor screen. One of the conclusions that analog system is much safer than IP camera system is not true. Both systems have the same security level. As long as the hacker make themselves enter your recorder (no matter DVR and NVR), they can retrieve the video easily. What should we choose? It depends on the budget and the system scales. If it is the small system upgrade, like home surveillance system, employing HD analog is reasonable choice. You can replace the camera and recorder, reuse the existed coax. However, if it is the middle or large system, such as hotel, choose IP technology could save the total cost and business downtime. Image the owner just asks for some new cameras setup or relocate the existed cameras, analog structure always require point to point connection. You have to hard wire a coax cable from the camera to recorder which could generate serious business downtime and heavy labor cost. With network technologies, you can simple get the connection from the nearest switch and complete the job very soon. Besides, you also will impress your client with IP image quality. Can we still reuse the coax to upgrade with IP video? Yes. The simple solution is the hybrid recorder. You can upgrade part of the cameras with HD analog cameras, and the rest with IP cameras. When the system expands, you start from the IP camera. Some of the VMS software is also available with hybrid input, like Exacq and Difgifort. The DVR can work as the encoder to convert the HD analog video to IP. In this case, the coax is reserved for analog HD camera. As we mention above, the image quality of analog HD is not good as the IP. If the image quality is critical to your client, you can employ EOC (Ethernet over Coax) to send the IP video. All the coax can be converted into the cable which is suitable to carry the network signal. You can replace the traditional analog camera to new IP camera in all the installation point. The power even can be sent over the coax up to 250 meters. Basically, the coax will be turn into network cable with EOC.